In the last year I recommended Fonar (FONR) at $9.10 and it is currently trading at $23.78! In the last year I recommended Advanced Micro Devices (AMD) at $1.61 and it is currently trading at $6.70! Now I am recommending Powin Energy (PWON) at $0.30 and I expect it will trade over $?.?? within the next year! POWIN ENERGY (PWON) 52 wk H/L is $0.30 - $1.70. Powin Energy (PWON ) may very possibly be my best pick ever, and yours to! Treat PWON like a new issue with very few shares available at the current price. I believe PWON is a "right place, right time" investment. PWON is truly one of those young companies where the stock price can climb quickly and stay up once it climbs. From $0.30 to $?.?? near term is a strong possibility and I am probably not far off. Seldom do I run across a company that is trading so low in price with so much going on. Although Powin Corporation has been around for many years the battery storage business has moved to the front of the line, and it should. Battery storage is an industry that can only grow and with Powin Energy's patented battery storage products we as investors have an opportunity to get involved with Powin in the early stages. If you want to experience Powin Energy visit the website. You will not only find an interesting site but you will also be treated with knowledge of products and concepts. This is one website you owe it to yourself to visit simply because there is much to much for me to put in this short recommendation. Yes I am recommending PWON as a stock to own, and even more so in this current overvalued stock market. I believe PWON offers all of us an chance to ride the waves of the market no matter how big the storm gets. PWON is a nice place to be. Because of the low float, and a price currently at the low, the stock will not be easy to get, therefore the early bird has a chance at the worm. I would not waste too much time getting in because this stock will climb quickly, making anything under a buck a great buy. Also, another reason get in soon is I expect quite a bit of strong news over the next couple of months. I am looking for "many more" contracts over the next year, making PWON possibly one of the fastest growing companies of 2016-17. You can read the past news announcements by visiting PWON's website. Clicking here will take you there. I hope you enjoy my story about Powin Energy , but don't miss out on this one. Get in now as there will be very few shares available under ?.?? ! 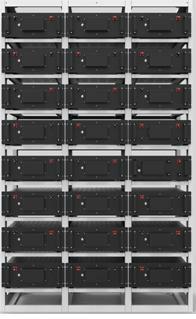 Our proprietary Battery Energy Storage System (B.E.S.S.) advances Powin Energy’s mission and battles global energy inefficiencies head-on. performance and safety in mind. Powin Energy - (OTC-BB) (PWON), was originally named Powin Corporation ("Powin") and was formed as an Oregon corporation on November 15, 1990 by Joseph Lu, a Chinese-American. Powin Corporation currently manufactures over 2,000 products. Since the early days of Powin Energy aggressive growth was in store for a company loaded with talent, great products and a strong future. There is much to learn by visiting Powin Energy's web site. Powin Energy has one of the most experienced management teams we could hope for. Powin Energy, a subsidiary of Powin Corporation (OTC-BB: PWON), is a leading designer and developer of safe and scalable battery energy storage solutions, based on its patented Battery Pack Operating System (bp-OS), for utility, microgrid and EV fast-charging applications. Over 100 years of collective energy and engineering experience goes into every Powin Energy battery storage system. Powin Energy's patented bp-OS helps extend the life of batteries by actively and reactively balancing battery functions down to the cell level. It also provides critical insight into battery system functions and lifespan via its proprietary Battery Odometer and Warranty Tracker™. For more information, visit http://PowinEnergy.com/. Powin Energy's proprietary Battery Energy Storage System (BESS) advances Powin Energy’s mission and battles global energy inefficiencies head-on. Clicking on each headline will take you to the rest of the story. It will open a new page so we will be here when you are finish. Battery cells are the smallest components of the BESS and contain the actual battery chemicals. Modules protect a group of cells from being strained to heavily. Each module comes with a controller that balance charges across its particular selection of cells. controller, ensuring that the modules behind each pack work together just as efficiently as the cells inside. Once all of the cells are aggregated into modules and packs they form a complete string. voltage, temperatures, and other critical data to the BMS. Click here to read all the news announcements. Powin Energy offers the early bird a giant worm. I don't often have an opportunity to introduce a "Featured Spotlight" stock of such quality, that has new and exciting products in the energy storage field that no one knows about. and a chance to own a piece of the future. In announcing its new patent, Powin touted two industry first: the Battery Odometer and the Warranty Tracker. The odometer tracks the batteries operations and gives insight into remaining life, while the tracker helps protect against use that could jeopardize the warranty. 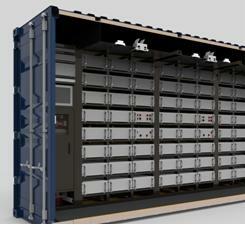 Powin,s flagship product is a shipping container that offers 500 kilowatt hours (kWh) of storage capacity. Powin delivers it, puts it on a slab, and ties it into the system. With the new patients, combined with a growing global need for battery storage, the future for Powin Energy promises to be something to we should be part of. There is so much to learn about Powin Energy that there is just not enough room here and I strongly recommend that you visit the Powin Energy website for a very interesting experience. Powin Energy is sponsoring a longer term investor awareness advertising program. The Stocks in the Spotlight never charges to recommend a stock, therefore any fees paid the Stocks in the Spotlight would be for advertising cost only. I feel a strong marketing program will introduce Powin Energy to many investors allowing the stock to move higher where it belongs. I believe that if we keep a good story like Powin Energy in front of new investors consistently, new investors will continue to buy and the stock will climb up the ladder. Once a shareholder in this one, it will be difficult to know when to sell. Right now taking a long term prospective would be the better bet. This is why I say -- Buy here and buy now! There is much to learn by visiting Powin Corporation's web site.